Click For Tickets! Pricing listed below. Local New England country artists couldn't be happier that their music now has a home on 101.7 The Bull. Hosted by Marlborough’s own Jessica Callahan, Sunday nights at 10 on the Bull, they roll out the top local and regional country music acts from right here in our own backyard. 101.7 The Bull’s Backyard Country guarantees you’ll hear your favorite local acts and discover music from New England country bands and artists. Backyard Country is where you’ll hear the next New England country star to make it big! Organized by local artist, Annie Brobst, "Backyard Country Live" is an event inspired by the radio segment featuring performances by artists whose original songs have been playing on 101.7 The Bull's Backyard Country! This is the third year for the event and after having sold out the first two years, we can't wait for the biggest year yet! 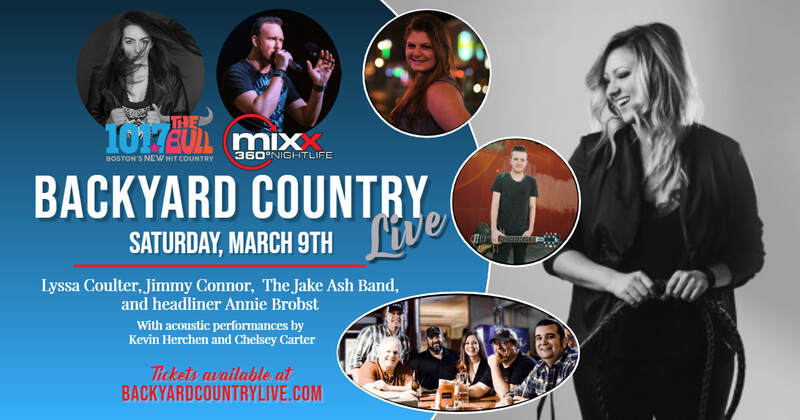 Join us this year at Mixx 360 in Malden, MA on Saturday, March 9 for Backyard Country Live! ​MARK YOUR CALENDAR AND COME RIGHT BACK HERE TO PURCHASE TICKETS STARTING ON THANKSGIVING DAY - THIS WILL SELL OUT! Doors open at 6:30pm. Show starts at 7:00pm. Special collaborations at 11:30pm.